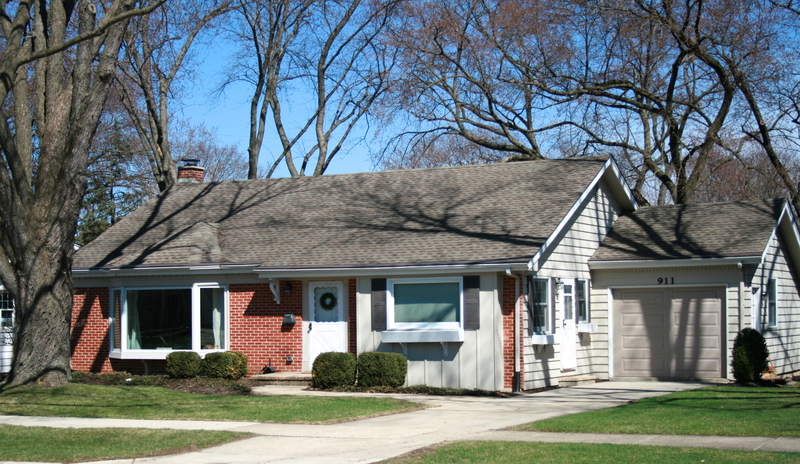 This darling home is nestled in one of Arlington Heights most sought after locations! Tree lined streets & quiet location with easy walk to downtown Arlington Hts, Commuter Train, Shopping, Dining, Library & Top Schools make this one shine! Upon entering home you'll love the bright rooms, rich hardwood floors & vaulted ceiling! Living room has a beautiful picture window, handsome beams & newly painted! Kitchen is finished in timeless white cabinetry, solid counter top with plenty of prep space & perfect sunny eating area! Master bedroom includes a private full bath! All bedrooms have hardwood floors & nice closets. Updated full hall bath with on trend white tile, new fixtures & finishes has a vintage feel! Lower level is wrapped in rustic shiplap & has a fun picture frame ledge for art! This would make for a great family room with the new flooring, paint & half bath! Utility room provides storage & opens to stunning oversized backyard! Full cement crawl space is a wonderful surprise!